Imprisonment for life inside a heart full of hurt and pain. Love that person you see in the mirror. When someone shows you their true colours, believe them the first time. Never try to paint a different picture. Set your standards high and keep them there. Set boundaries and don’t let anyone cross them. Respect yourself enough to walk away when someone treats you poorly. 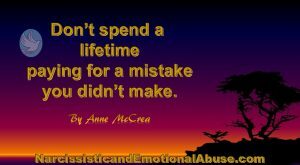 Don’t make anyone else pay for a mistake they didn’t make. Set yourself free and live and love your life, your way. That is not being selfish, but absolutely necessary. I have recently split up from a relationship he verbally abused me then tried to blame me by gaslighting. It kept going and I kept going back because I loved him or so I thought. The best decision I made was to get out of it. It’s hard but your life will be better in the long run.